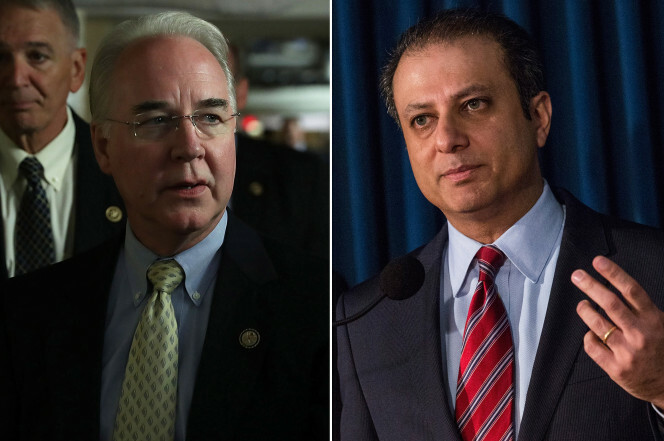 Fired US Attorney Preet Bharara was investigating a key member of President Trump’s cabinet, a new report Friday revealed. Trump’s head of the Department of Health and Human Services allegedly, traded stocks of health-related companies while working on legislation affecting the same firms. Insiders says Bharara was overseeing an investigation. Price maintains that he broke no laws when he traded health care stocks even as he was involved in legislation relevant to the health care sector. He traded over $300,000 worth of shares of relevant companies during a four-year period in the House. The revelation that Bharara was investigating Price comes as many were surprised the US attorney from the Southern District of New York a carryover from the previous Democratic administration was not retained by the in-coming Trump administration. The then-president-elect met with Bharara after the election and during the transition period, when Trump reportedly asked him to stay on during his administration. But last week, Attorney General Jeff Sessions notified all leftover federal prosecutors appointed by President Obama that they would be let go. Bharara, however, refused to go and was fired by the Trump administration. In December, the Wall Street Journal had reported that Price traded more than $300,000 worth of shares in health companies over a recent four-year period, while taking actions that could have affected those companies. Price, an orthopedic surgeon, chaired the powerful House Budget Committee and sat on the Ways and Means Committee’s health panel. In one case, Price was one of just a handful of American investors allowed to buy discounted stock in Innate Immunotherapeutics, a tiny Australian company working on an experimental multiple sclerosis drug. The company hoped to be granted “investigational new drug” status from the Food and Drug Administration, a designation that expedites the approval process. Members of congress often try to apply pressure on the FDA. As ProPublica has reported, Price’s office has taken up the causes of health care companies, and in one case urged a government agency to remove a damaging drug study on behalf of a pharmaceutical company whose CEO donated to Price’s campaign. However, Innate Immunotherapeutics’ CEO, Simon Wilkinson told ProPublica that he and his company have not had any contact with American law enforcement agencies and have no knowledge of authorities looking at Price’s stock trades. Another transaction that drew scrutiny was a 2016 purchase of between $1,001 and $15,000 in shares of medical device manufacturer Zimmer Biomet. CNN reported that days after Rep. Tom Price [R-Ga] bought their stock, in 2016, Rep. Tom Price introduced legislation that would have directly benefited the company, he introduced legislation to delay a regulation that would have hurt Zimmer Biomet. The development raises new ethics concerns for the new Health and Human Services secretary. Coincidentally, the Less than a week after the transaction, the Georgia Republican congressman introduced the HIP Act, legislation that would have delayed until 2018 a Centers for Medicare and Medicaid Services (CMS) regulation that industry analysts warned would significantly hurt Zimmer Biomet financially once fully implemented. In a third case, reported by Time magazine, Price invested thousands of dollars in six pharmaceutical companies before leading a legislative and public relations effort that eventually killed proposed regulations that would have harmed those companies. Time reported that then Rep.Price in 2016, invested as much as $90,000 in six pharmaceutical companies shortly before leading a legislative and public relations effort that benefited those specific companies, records show. On January 9, Rep. Louise Slaughter,[D- NY] who sponsored the STOCK Act, wrote in January to the SEC asking that the agency investigate the affected stock trades made by Tom Price: “The fact that these trades were made and in many cases timed to achieve significant earnings or avoid losses would lead a reasonable person to question whether the transactions were triggered by insider knowledge,” slaughter wrote. Along with the Price matter, Bharara’s former office is investigating allegations relating to Fox News. Another likely bone of contention is the crescendo by watchdog groups urging the prosecutor to look into payments Donald Trump has received from foreign governments through his Manhattan-based business.